One of the more common species of longhorned beetles (family Cerambycidae) in Missouri, and throughout the eastern U.S., is Stenosphenus notatus. Despite its commonness, however, it is a species that is easily overlooked because of its very early seasonality, emerging during the first warm days of spring (late March here in Missouri) and disappearing by the time the bulk of longhorned beetle species become active during late spring and early summer. I found this individual on a recently fallen mockernut hickory (Carya alba) during the 2nd week of April, as Rich and I hiked the lower portion of the Wappapello Section of the Ozark Trail in southern Missouri (along with several other wood boring beetles species such as Dicerca lurida, Megacyllene caryae, and the woodboring beetle predator Enoclerus ichneumoneus). Longhorned beetles display a variety of host fidelities, ranging from highly polyphagous to strictly monophagous – this species falls near though not quite at the latter end of the spectrum, being associated almost exclusively with the genus Carya (hickories and pecan). I have reared adults from dead branches and trunk sections of not only C. alba, but also C. aquatica (water hickory), C. laciniosa (shellbark hickory), and C. ovata (shagbark hickory) (MacRae 1994, MacRae and Rice 2007). Linsley (1963) also records Celtis (hackberry) as a host, but I have not seen the species myself in association with plants of that genus, nor have I seen other literature references to such – I suspect this may, in fact, be an incidental adult association rather than indicative of a true larval host (an all too common problem in interpreting literature on woodboring beetle host plants). 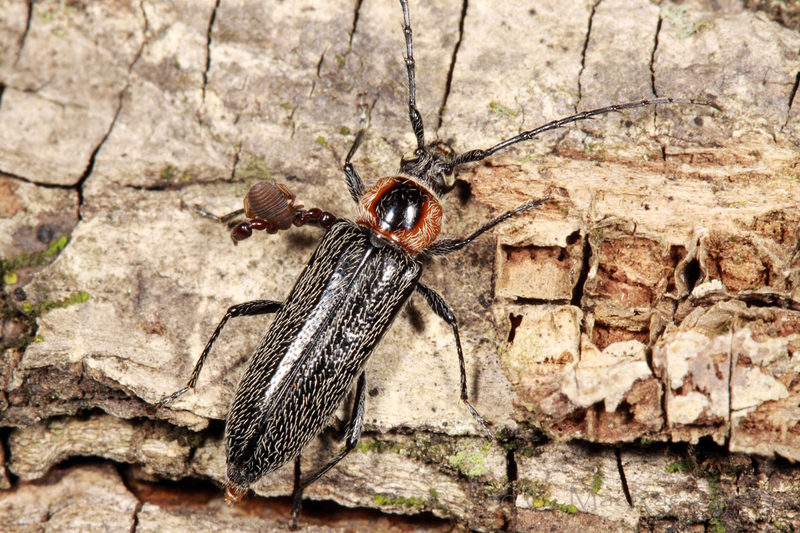 The very early spring occurrence of this insect can be traced to a peculiarity of its life cycle shared by few other cerambycid species in the eastern U.S. – overwintering in the adult stage. Most eastern U.S. longhorned beetles overwinter within the host wood as either partially or completely grown larvae. Warming temperatures in the spring trigger resumption of growth in the former and a transformation to the pupal stage in the latter, which emerge as adults a few weeks later during mid-late spring. In contrast, S. notatus – which requires two seasons to complete its development – pupates in the latter part of the second season and transforms into the adult before the onset of winter. When warm temperatures return in spring, the adults are ready to emerge and search out fresh hickory wood that has died within the past few months on which to lay their eggs and begin the cycle anew. As I photographed this individual, I noticed an object attached to its left mesothoracic (middle) leg. Zooming in on the object showed it to be a pseudoscorpion – a type of arachnid (relative of spiders, mites, and true scorpions) in the order Pseudoscorpiones. I have not the resources nor the expertise to attempt a more specific ID, but its attachment to the beetle almost surely represents an example of phoresy – defined as a phenomenon in which “one animal seeks out and attaches to the outer surface of another animal for a limited time during which the attached animal (termed the phoretic) ceases feeding and ontogenesis, such attachment presumably resulting in dispersal from areas unsuitable for further development, either of the individual or its progeny” (Farish and Axtell 1971). Pseudoscorpions have been reported attached to insects from several orders, primarily Diptera but also beetles and including longhorned beetles (Perry et al. 1974, Haack and Wilkinson 1987). Many species of pseudoscorpions develop beneath the bark of dead trees and prey upon the many other small insects and mites found there, and it would be reasonable to presume that their most effective means of dispersal to new habitats (i.e., dead trees) would be by “hitching a ride” with adult woodboring beetles as they emerge and fly to these new sites. As obvious as this explanation might seem, few data have actually been generated to demonstrate it is actually the case, and several competing hypotheses such as accidental boarding (hitching a ride by accident), obligate symbiosis (the pseudoscorpions live exclusively on the beetles), and phagophily (preying upon other beetle associates such as mites) have been offered as alternative explanations. However, at least one fairly recent investigation on the pseudoscorpion, Cordylochernes scorpioides, a frequent inhabitant under the elytra of the giant harlequin beetle, Acrocinus longimanus (family Cerambycidae), does seem to not only support the dispersal hypothesis, but also suggests that large male C. scorpioides even defend a beetle’s abdomen as a strategic site for intercepting and inseminating dispersing females (Zeh and Zeh 1992). Farish, D. J. and R. C. Axtell. 1971. Phoresy redefined and examined in Macrocheles muscaedomesticae (Acarina: Macrochelidae). Acarologia 13:1629. Haack, R. A. and R. C. Wilkinson. 1987. Phoresy by Dendrochernes Pseudoscorpions on Cerambycidae (Coleoptera) and Aulacidae (Hymenoptera) in Florida. American Midland Naturalist 117(2):369–373. Linsley, E. G. 1963. The Cerambycidae of North America. Part IV. Taxonomy and classification of the subfamily Cerambycinae, tribes Elaphidionini through Rhinotragini. University of California Publicatons in Entomology 21:1–165, 52 figs. Perry, R. H., R. W. Surdick and D. M. Anderson. 1974. Observations on the biology, ecology, behavior, and larvae of Dryobius sexnotatus Linsley (Coleoptera: Cerambycidae). The Coleopterists Bulletin 28(4):169–176. Zeh, D. W. and J. A. Zeh. 1992. On the function of harlequin beetle-riding in the pseudoscorpion, Cordylochernes scorpiones (Pseudoscorpionida: Chernetidae). Journal of Arachnology 20: 47–51. 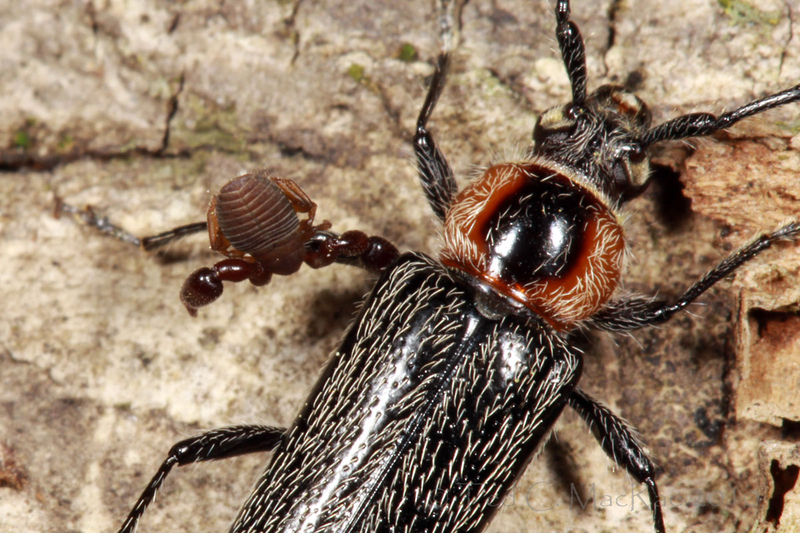 This entry was posted in Cerambycidae, Coleoptera, Pseudoscorpiones and tagged arachnids, beetles, entomology, insects, longhorned beetles, Missouri, nature, phoresy, pseudoscorpions, science. Bookmark the permalink. As far as hitch-hikers go, this one is far more hefty than the mites I come across. Phagophily would seem a bit awkward with the pseudoscorpion in the current position. It does make you wonder if that burden on the one side would make this beetle fly in circles! Debates about the definition of phoresy can get fairly pedantic – and generating new terms for every variant could be considered a variant of mihi-itch. I think the critical aspects of phoresy is that the behaviour changes from normal. An animal stops (or starts in the case of water mite larvae – seee below) feeding, fooling around, and avoiding big scary things like beetles and instead seeks out a carrier, attaches, and bides its time until a cue(s) says time to party again. I’d agree with Adrian – this sinister single-clawed grip of this tail-less hobgoblin doesn’t look like a daily ritual and that makes a prima facie case for phoresy. Phagophily – ugh – what animal doesn’t love to eat? Water mite nymphs and adults typically are predators of insect eggs, small crustaceans, or some other small prey. The larvae, however, are ectoparasites of aquatic insects, but also use the insects to disperse. I’d still consider this phoresy because the beahviour changes to facilitate dispersal and getting a good feed is just part of the ride. Same for the hemisarcoptid mites that hitch rides on lady beetles – they have no functional mouthparts, but can absorb hemolymph from reflexive bleeding (and may even be able to induce it) – but I would still consider this behaviour phoresy. Well, maybe phlebophoresy. Hi Dave. That key was one of the first things I found when I started looking into this – unfortunately I don’t have the specimen and so cannot count leg segments and hairs to navigate even past the first couplet. Pseudoscorpions are sorta cool, but they don’t send me in the same way that other ‘scorpionoides’ do (like whip scorpions, tailless whip scorpions, and the totally hecka-cool sun scorpions!) so it’s not likely I’ll ever sit down with specimens and try to key them out. Phagophily – it’s a good thing I’ve got a fairly high-class readership. I can imagine the adolescent jokes that such a term could elicit amongst a more infantile readership! I do think you nail it with the requirement of change of behavior for the express purpose of dispersing as a threshold character for phoresy. You so need to do a post on mite phoretics associated with beetles! Nice picture! I particularly like the second. I’m always amazed by how many people have seen pseudoscorpions hitching a ride. Thanks, Dave. Just so you know, the second photo is a separate shot and not a cropped version of the first. If you feel like trying to ID the pseudoscorpion (one of my favourite non-insect inverts) try out the recently published keys in the Canadian Journal of Arthropod Identification. Although specifically for Canada, I would guess you might get a subfamily or maybe a genus out of it! See response to macromite. Actually, on second thought, knowing that there is a resource such as that, I might be tempted to actually collect some pseudoscorpions and try to key them out. Like I really need one more taxon to become interested in! As for the pseudoscorpion, my immediate thought was phagophily, if not outright eyes-bigger-than-stomach predation of the beetle. I’ve seen them take on much larger prey–spiders and scorpions many times their size being good examples–so it’s not unheard of for them to tackle the seemingly impossible. In any case, a cool little mystery to consider. Thank you, Jason. Yeah, your eyes-bigger-than-stomach thought is exactly what keeps me from swallowing the phoretic explanation hook-line-and-sinker. Not that I think it is not phoresy, I just think an automatic predator response to contact can’t be ruled out in the absence of data. Hanging out there on the leg like that seems a bit of a risky strategy for dispersal – in the giant harlequin beetle referenced in the post, the phoretic pseudoscorpions actually tuck themselves underneath the wings on top of the abdomen – safe and protected. I’m fascinated by this example of phoresy – a concept that is new to me. I know I’ve said this before, but I always learn something new here. Very cool. Hi Eric — sounds like a good possibility. You can’t be blamed for missing it – I didn’t even realize this one was present until I had the beetle closeup in the viewfinder. I’ve seen pseudoscorpions on a number of other longhorned beetles. Great photo! Did you collect the pseudoscorpion and the beetle by any chance? Please send me an email if you did, I’m working with pseudoscorpions for my PhD and am curious to know if this critter might be in the same genus I’m revising. I’m not sure—the beetle is a fairly common species in Missouri so I may not have. I’ll check the collection and see if I have it. If I do I’ll let you know.